Go See This contributor Andra Leijon leads us through the highlights of Manchester's sweet treats. Go See This contributor, Andra Leijon rounds up the best dessert spots in the city. Now that the summer season is nearing its end, the perfect opportunity arises for all of us to visit restaurants, cafés and shopping malls and warm ourselves up while enjoying a treat that will surely silence the menacing whispers of our sweet tooth. For this purpose, I have compiled a list of 5 of my favourite places in Manchester where you can find amazing desserts at affordable prices (mostly the new trend of bubble/normal waffles which I’ve developed an obsession with, and, I’ll warn you now, you might too!). To express my lifelong love for Cypriot and Greek food, Kosmos Taverna will be my first mention for its amazing desserts with their own cultural twist. My recommendation is the “Pagoton Me Filfar” as it’s likely nothing like what you’ve tasted before. It’s made of vanilla ice cream and meringue, topped with orange liqueur originating from Cyprus itself. Kosmos Taverna is on Wilmslow Road and is the perfect destination for a full 3 course meal! Black Milk is already a fairly popular destination in the Northern Quarter. They provide customers with a good variety of milkshakes, waffles and other sweets. I fell in love with the strawberry and Nutella waffle which was very affordable and consistent (around £8) and could easily feed two people. Other than its NQ location, Black Milk can also be found in Bolton. 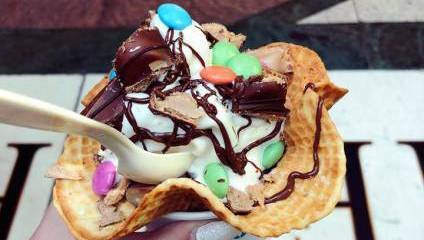 Creams Café is an appetising option bringing Italian gelato to Manchester. Their menu will make any customer indecisive as to their choice between sundaes, crepes, waffles, gelato and sorbets. The ultimate chocolate bubble waffle is my weakness and I’d love it if you found yours here as well! Nearly every dessert is under £10 and Creams Café can be found in multiple locations around Manchester. Another favourite is The Shake Lab, with waffle cups, cones and, if you’re feeling extra creative, sticks! The waffle sticks look like something truly unique, but the dessert that stole my heart is the Smarties and Kinder waffle cup, which is less than £5. The Shake Lab is located on the top floor of the Trafford Centre, which makes it the perfect stop after a shopping spree. Finally, there’s Bobo Tea, which sells probably the best waffles I’ve had in my life. They have a variety of bubble teas, smoothies, bubble waffles and other delicious treats. My personal favourite is the customised waffle with Oreo, Kinder and strawberries for just under £6. Bobo Tea can be found on the upper floor of the Arndale Centre.